Some might say your age qualifies you as being "over the hill." But you know things are just getting started! With the years you've acquired more than just a few gray hairs. You've grown as a person, developing confidence and character. You know you to laugh, how to cry and how to blow off steam with enthusiasm! Red Hat Address Labels were made for women who have a hunger for a life filled with joyful experiences. 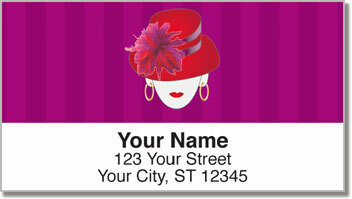 Let these unique return address labels add color and charm to every envelope you stick in the mail. Use them to make preparing outgoing mail extra easy and forget the painstaking process of writing your name and address by hand. That means more time for fun! 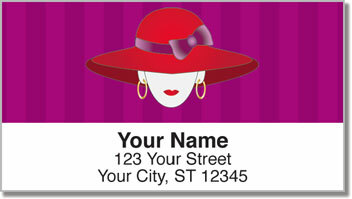 Order your own Red Hat Address Labels right now! 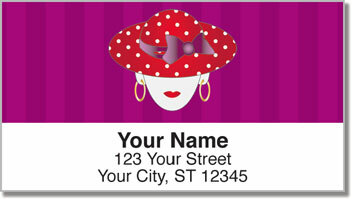 Don't forget to take a look at the matching personal check design.